Because it’s black and white and red all over! Geddit? Geddit? Oh, and it’s covered in typewriters. That might have something to do with it. One of the perils (if you can call it that) of teaching at The Village Haberdashery is that I am in the shop all the time and consequently end up wanting everything. 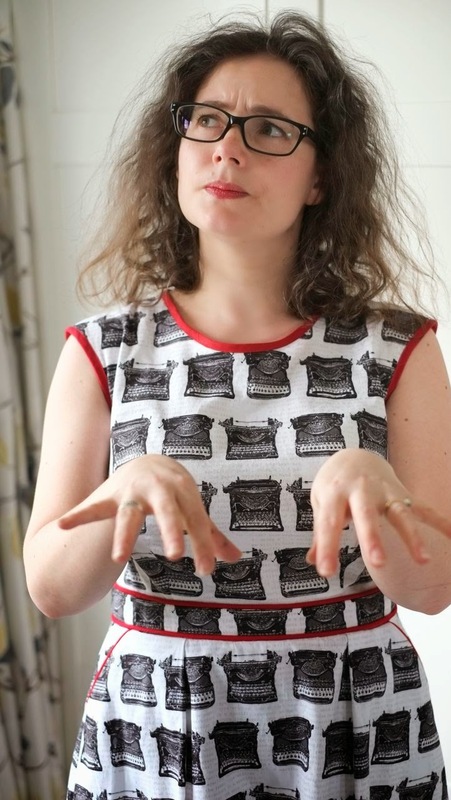 A few weeks ago there was just enough of this amazing typewriter fabric in the sale section to make a Deer and Doe Belladone dress. It was fate. I added piping at the waistband and on the pocket edges to match the bias binding around the neck, back and armholes. Kona Rich Red was the perfect shade to set off the black and white. I finished the hem with bias binding instead of the facing called for in the pattern, just so I could add a little more red. Pattern matching? What pattern matching? My favourite feature is the keyhole back. I think it’s so pretty, especially when bound. This is optional according to the pattern, but it really finishes things off so nicely and gives that extra bit of body to the fabric. Well worth the extra time, I think. Look at that crochet loop! All in all I am so happy with this dress. I’m definitely at that age where I can wear whatever the bloody hell I want without having to justify my fabric choices. Being in your 40s isn’t so terrible after all. Also, I was more than a little inspired by the wonderful fashion stylings of Roisin (Dolly Clackett). One day I will have a handmade wardrobe just like hers. And what would a dressmaking post be without the traditional action shot? In case you can’t tell, I’m pretending to type, not waiting for my manicure to dry. I’m entering this into the Sew Dolly Clackett challenge. If you have a minute, check out the other entries – they are amazing! "That's a nice dress! Did she make that? Clever!" Look at you with your glam red lippy!!! I *NEED* that dress. Make them and sell them, goddammit, you clever, gorgeous lady! You know…if I saw that print on a bolt I wouldn't pick it for a dress…but it works wonderfully! And I totally agree with you on that red. Can I be the first (today, at least) to say you're adorable? Yes? Thanks. You're adorable. Oh you so clever, and nutty! LOVE that dress!!! 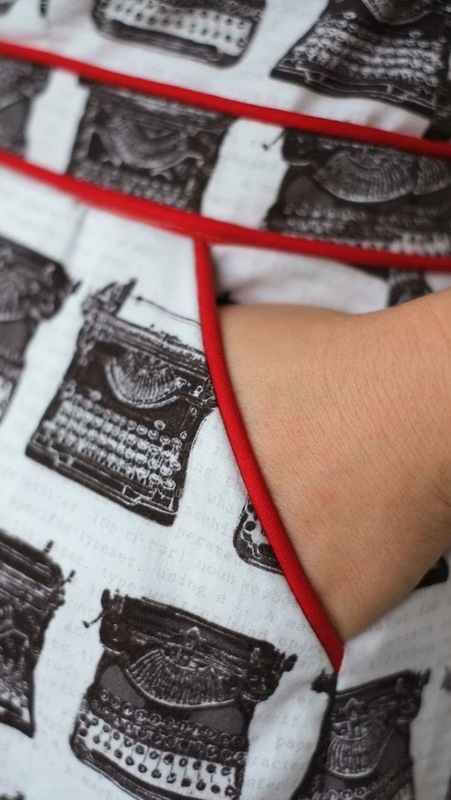 The red piping is SO perfect! Bravo!!!! Looks fab, and love the name! Nailed it! You're gaining an enviable handmade wardrobe lately! That's wonderful Charlotte, so impressed- and really fun to have watched your progress here, it's great! I can just see Patrick running his fingers down that zipper. Fab dress!! I thought you had a new job!! Looks fab! I think the red binding really finishes it (am both a red and a bias binding fanatic, so this was bound* to be right up my street). 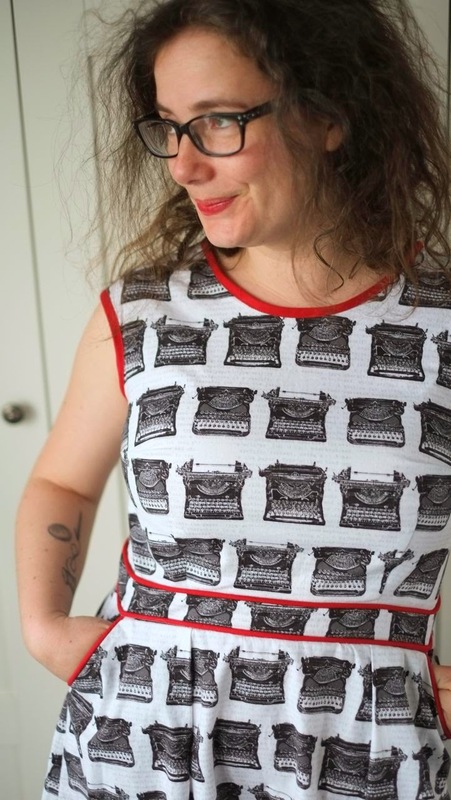 Typewriter fabric is fabulous – hadn't seen this print before, makes a great dress! Fantastic modelling, as ever. What a fab dress! 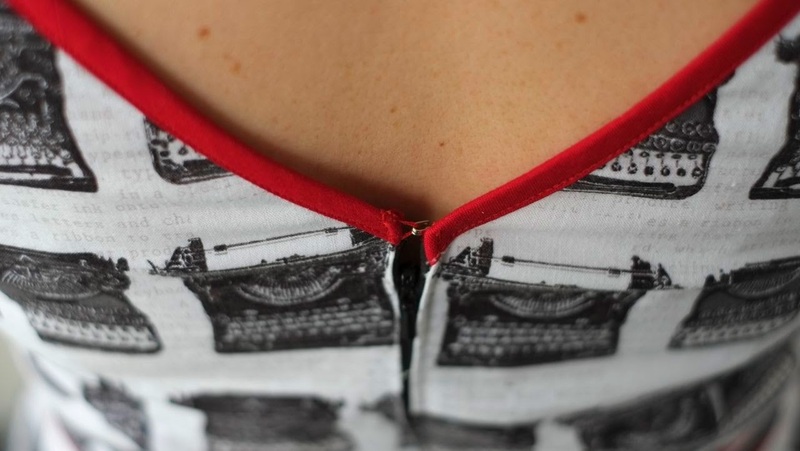 Love the piping trim and the keyhole back. 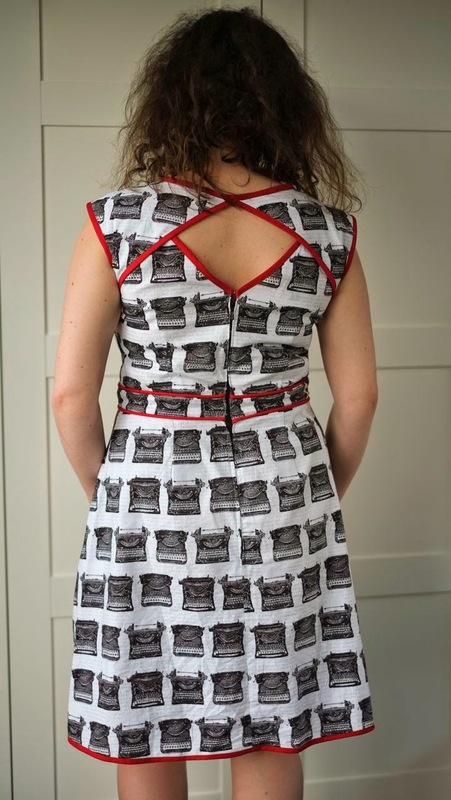 And thank you for the link to Dolly Clackett – another fab blog (and another kick up the bottom to tell me to stop procrastinating and just MAKE A BLOODY DRESS). Hope this lovely dress gets lots of wear this summer! Truly wonderful and amazing! I can make all kinds of quilts but clothing is more of a challenge for me cause it actually has to fit my body. What they all said, you look gorgeous, great dress, love the print and the red etc, etc, and how cool is your hair, you look slightly mad, it's so cute!!! Perfect dress to shove ice cubes down your back! Beware! But gorgeous and glad to see the poses again! Keep up the good work! My favourite of your clothing makes so far. Love the dress – you look fab in it. Great choice of fabric! Love everything. What is the pattern sizing like? True to the numbers?